Happy release day to M.C. Frank for her newest novel. Everything I Do, a retelling of Robin Hood that will destroy your heart in the best possible way. I had the absolute pleasure of reading an advance copy of this book and fell totally and helplessly in love. Let me preface my review with my one let down: I NEED MORE OF THIS BOOK. It was over so quickly I reached for the sequel only to remember that it’s not even in the works yet! Oh please of place I need more! Everything I Do is Frank’s best work yet. It takes a classic tale and gives it a believable twist, and I could almost believe this is the real legend of Robin Hood. The cast of characters gives me total #squadgoals and I love each and every one of these forest muffins. It’s a recipe for success, and totally unforgettable. Robin and Ru’s playful relationship as outlaw teacher and student casts a sharp contrast to the backstory that is slowly revealed. I loved the twists – the biggest one being precisely at the midpoint of the book, which was brilliant – and the way the ending changed our entire perspective of the story. You can really feel the love she’s poured into it as she wrote it. I read old reviews for the first version of this book Frank worked on, and see she’s taken everything into consideration into making this book a success. As you can tell, I’m struggling to put my ideas in any precise order, but it’s because I’m so in love with this book that I’m just babbling about how awesome it is. It’s the beginning of a fantastic series, and I can’t wait to read what happens next – especially after that ending! I think the best place to start is at the start! How did the idea of doing a Robin Hood retelling come to you? I have loved Robin Hood since I read his story when I was nine or ten. From that day, I started plotting the story of Everything I Do in my head (as crazy as that sounds). Two characters from my childhood daydreams have even made it all the way to the book, can you believe it? Heavily of course, but still! It goes to show how much childhood stories stick with us. Did anything from the first draft stick all the way through? Were the characters of Robin and Run always the way they are now? No, pretty much nothing from the first draft is the same, except some basic things. But all of the names, characters have changed. Three major plot points are exactly the same since I started writing it years and years ago. But pretty much everything else is changed. Who was your favorite one to write – the Robber or the Princess? Ah, that’s a cruel question, Sarah, haha! As an author yourself, you know how impossible this is to answer. I loved the pain and despair behind the Princess chapters, but of course I have a soft spot for your tortured bad boy, so the Robber chapters always came out like a breeze. It always took me a moment to get inside his head, however, as I haven’t had personal experience with being so highly confident and capable as Robin is. So that took a bit of imagination. One of the things I really liked was the team Robin has supporting him. As I said in my review, they’re ultimate #squadgoals. Do you have a favorite character outside of the two main ones? Which was the most fun to write? I’m in love with that hashtag #squadgoals, it’s perfect! Of course, Will my poor baby is my obvious favorite, but I also loved Alis. She is so feminine but kickass, the opposite of Ru in many ways. She’s unapologetic and brave, but also very tender and mothers the boys. I love her. Along those same lines, who would you have stand with you in a fight? Robin, of course, since his fighting skills surpasses everyone else’s. However, he might not be available at the moment, since he’s got so many things going on (to put it mildly) I’d always pick John Lyttle. A gorgeous Viking giant to defend me from all the internet bullies, that’s what I need. A good story is a story that makes you think and feel. If the writer is invested while creating it, then the reader is more likely to relate and then the book will stick with them forever. I read somewhere that the mark of a good book is how long after reading it you remember everything about it. I completely agree. Everything. Books, movies, my own daydreams. Memes, K-drama, Jane Austen… (I could go on forever). I can tell you really took the readers’ comments into account when you rewrote this new version. I absolutely loved it, and I feel like it must be an entirely different book to the one that came before. Just how much has changed? Thank you so much! As I mention on my blog, (read the full story of what happened here) I completely rewrote Everything I Do and republished it. The old version was live for a bit less than 2 months. So, I didn’t just change the book, I rewrote it. Everything is different. Names, characters, scenes. Robin’s age changed, his looks, his motives, his backstory. Literally everything. Ru didn’t even exist in the old book. And so on about Robin’s men and the villains… The only thing that’s the same is the name Robin Hood, although Robin’s title and last name are changed as well! What was one of the most surprising things you learned in writing Everything I Do? How a human being can be absolutely destroyed in a few days, and how it takes years and a lot of love to restore them to greatness. It never ceases to amaze me that it is possible to be redeemed, even if you are completely broken. I started writing Everything I Do in order to show this, and it was so hard to do as the story progresses in the series (but I think I’ve succeeded). Imagine how much harder it is in real life! But it is possible, that’s all that matters. I absolutely loved the way the book ended – well, more like I screamed to the heavens, begging for the sequel! How long do we have to wait for the next installment? And what are your plans for the series? Haha, that warms my heart! Thank you! I always want my readers to suffer… erm, or something. I talk frequently on my blog mcfrankauthor.tumblr.com and on my Instagram @mcfrank_author about my Robin Hood series plans, because they constantly change! So far, the first 5 books have been fully outlined, and of them, the first 3 are fully written! So you may expect the next installment in the fall or winter of 2019. Reading! I am a bookworm (or actually a book-eater). I read about a book a day, to keep the imagination fuels full. It’s been a while since I did a self-pub Saturday! Today, I’m bringing you an interview with one of my favorite self pub authors, Andrew Gates. You might remember him from such books as ‘Iris’ and ‘Hive’ – his incredibly epic Color of Water and Sky series. 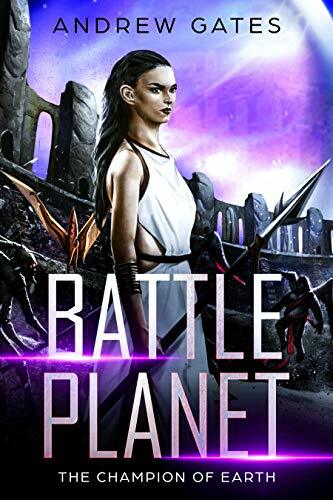 As that series ended, new ones begin: this young author has big plans for new books, and his latest Scifi novel, Battle Planet, is intended to release on the 23rd. Berlin in 1988. Rock music, revolution, gladiators in space. Janice Milani was an ordinary American abroad in Berlin during the final days of the Cold War… until she was taken in the night by an alien captor. Now Janice, along with four other captives, suddenly find themselves on an alien world where sentient creatures from across the universe are made to fight in the Battle Arena for sport. Desperate to escape the arena and get back to Earth, the only way Janice can get home is to be crowned as champion of the games. And to do that, she will have to fight like she has never fought before. Let’s start at the very beginning. How on earth did you come up with the concept for Battle Planet? Ha! That’s probably the best question. The biggest influence I had is a Marvel comics event series called Secret Wars, which came out back in the 80s. The premise is that superheroes and villains are kidnapped from earth and forced to fight each other by a being named the Beyonder. I think that premise in itself is just so cool. And with the recent success of the movie Thor: Ragnarok, I figured the timing for a story like this was good because there is clearly an interest in an outer space gladiator story. In fact, the villain in Battle Planet, Queen Jakani, was inspired by the villain from Thor: Ragnarok, Hela. What prompted you to make it start in the 80’s, in Berlin? How is Janice’s character different from a woman from 30 years in her future – 2018? It’s kind of a strange thing of mine, but I have never been a fan of stories set in the present day. The reason for this is that I find if you were to read a story any other time after the book comes out, it gets dated pretty quickly. And it’s not just books. To be honest it even bugs me when I watch a movie and it says “present day” in the movie because I know that if I watch this movie 10 years from now, it’s immediately dating itself. So instead I like to set things in period because you can read period stories at any time and it’s supposed to be dated. Doing this also allows the writer to take full advantage of everything that time period has to offer – that could be anything from grand geopolitical elements to something as trivial as music or fashion. This wasn’t so much of an issue for me when I was writing The Color of Water and Sky because that story is set in the future, but if you read my short story collection, Kangblabla!, I have five stories in that collection. Three of them are in the future, one of them is in the 90s and one of them is in the 70s. Nothing is set in the present day. Tell us a bit about the Battle Arena. What kind of creatures find themselves there? And who watches the games, as a spectator? Take us there briefly? Every type of creature finds themselves in the Battle Arena. Part of the fun in writing this is coming up with crazy ideas for creatures that might be in the arena. This was where I was really able to push the full limits of my creativity. There are creatures who can split apart and put themselves back together, creatures who can turn invisible, who have two heads or multiple limbs, creatures that are more tree-like than they are animal-like, creatures that are huge or tiny. And obviously, some creatures are more familiar to things we know on Earth than others. The humans who are taken to the Battle Arena were taken there at complete random, which was something I thought was important because I wanted to get a unique cross section of humankind on this planet. The idea is that five random people are picked with no preference towards any single trait whatsoever. So obviously if that were to happen, you would get a totally random mix of genders, ages, races, nationalities, physical abilities, education and so forth. For example, of the five people taken in Battle Planet, two are Asian, one is European, one is North American and one is South American. There are three females, two males. The ages range from young kids to elderly. That is also where the Cold War aspect of the story comes into play, because in this time-period, you have all these people from super polarizing political climates forced into a situation with one another where they need to work together and get along. These national identities and national experiences are what drives a lot of the characters and their trust or distrust for one another. As for the spectators, they’re just there to have a good time and watch the games. They aren’t sickos or sadists necessarily who love to watch pain and torture in the gladiator games. For the spectators, watching people fight to the death is totally normal in the same way that ancient Romans would watch gladiator matches thousands of years ago. The competitors in the arena don’t view the spectators so nonchalantly though. Was Janice you favorite character to write in this new book, or are there other characters waiting to steal the crown? Do you have favorites when it comes to the writing process? I think more interesting than any individual character of Janice was the story as a whole. The shared experience that all five of these folks go through is really the most interesting part for me. And honestly, the character of Janice would be nothing if she weren’t working off of the other characters around her. The interaction between the different characters is really the payoff rather than one individual character standing out. Though I will say, Janice has an excellent taste in music, which is basically just my taste in music expressed through her. This is your first novel outside of your epic Color of Water and Sky series. How was the writing experience for you, writing in an entirely new world? When you started, were you still working on HIVE, the conclusion to your series, or had you already finished it? I was still working on Hive at the same time, yes. Interestingly the idea of doing something new and the excitement around starting a different project led me to write Battle Planet extremely fast. This is easily the fastest story of this length I have ever written and I think it was because I was just so excited to get working on something new and different. What was one of the most surprising things you learned in crafting your books? I’ve learned that writing a novel isn’t all that hard so long as you are confident in what you are doing. I think that is another part of the reason this story came together so quickly. When I first wrote Iris, that took me a LONG time. Granted, it was a longer book, but the pace at which I wrote was much slower and I would constantly go back and re-edit everything tons of times. I think, for most writers, this is true for their first couple of books. But now that I am more confident, I am writing much faster and not micro-editing everything all the time. Will Battle Planet be the beginning of a new series, or stand entirely alone? I am still trying to determine the answer to that question myself, but if I do end up writing a second one, it will likely be a prequel instead of a sequel. I think it would be really cool to do a story set in ancient times. There are definitely a lot of things about the Battle Planet that I intentionally left unanswered so there is certainly potential there if I wanted to do a prequel. You have so many incredible books coming out this year. I’m really excited to get to read them all. Can you tell us a little more about what’s coming our way? What are you most excited about sharing with us? April is an awesome month for me and I am doing that intentionally. I have had some projects that were basically ready to go that I have held off on until now because I want April to be a huge month. One week after Battle Planet’s release, I’ll be releasing part one of a three-part series. The book is called Seas of the Red Star and the series is called Pirates of Vexa Prime. The book originally started as a co-authorship between me and MD Cooper, but a few things changed and now the story is 100% mine. The premise is really interesting. It’s about two starship pilots who are stranded on an ocean world, where 18th Century sailors live. The pilots have to get off world and back to their home without any tech and their only help comes from a society that still hasn’t even figured out combustion engines yet. It’s already up for pre-order here. One week after that, the sequel to Seas of the Red Star will come out, called The Daltus Conspiracy. It is also up for pre-order here. I also have a new short story coming out as part of an anthology put together by Keystroke Medium. The story is about a virus that has destroyed most of the human population and only those people in remote places are still alive. That will come out sometime in April or May, but I don’t know the exact date yet. Mostly my readers are frustrated that the alien character names are so hard to pronounce. Outside of writing, what does Andrew Gates get up to? I’ve been super into Halo lately. I love watching movies too. Everything that Marvel is putting out recently has been top notch. I also like running (I’m doing a full marathon the day after this interview gets posted actually). I also write for a local running magazine called Run Washington Magazine. You can find all that stuff here. Battle Planet: The Champion of Earth is slated to release on April 23rd, though you can preorder your copy now! Once I got into this book, I couldn’t put it down. It was like the Grishaverse, except so much darker, and more gruesome: as if someone stitched Nevernight and Shadow and Bone together and didn’t apply a bandage. So if you don’t like blood, turn away now. My only qualm with the book would be how gratuitous it was with all the bloodletting, cutting, and just everything blood; but I’m willing to look past it since it was such a gosh-darn great story. Three characters come into play: Nadya, a cleric girl given power by the gods, trying to save her country; Serefin, prince of the enemy country, and Malachiaz, a mysterious boy on the run. We have holy, royal, and cursed – and each willing to do what they must to get what they want. Nadya’s nation has been in a holy war with Serefin’s for centuries. While her country worships the gods, Serefin’s has renounced them, taking power from within under the form of blood magic. Both want the war to end by any means possible, and will become who they must to tear town the enemy. So far, it might seem formulaic. Until the author does one single, tiny little thing: she makes her characters begin to question where the gods actually come from. All of a sudden, the holy war seems inconsequential, as we realize that there is so much more at play. The author delves into the complex issues of wars fought over ideals, of the people who are caught in between. And I was hooked. It’s basically YA on steroids. Everything is ramped up x1000: the blood, the magic, the complexity. Nothing was predictable. I really don’t want to give anything else away if I can avoid it, so I’ll stop my review here. But this book is really going to blow everyone away – I guarantee it! OUT TODAY from Wednesday books! It’s such a fascinating adventure to read your favorite author’s debut novel. V.E. Schwab is one of those instabuy authors of mine who would put any book out there and I’d preorder with my eyes shut. But the Near Witch was still one of hers that I hadn’t read yet, simply because I couldn’t find it anywhere. I was so excited for the new edition, and reading my favorite author’s first book was so much fun! The Near Witch’ is only an old story told to frighten children. If the wind calls at night, you must not listen. The wind is lonely, and always looking for company. There are no strangers in the town of Near. These are the truths that Lexi has heard all her life. But when an actual stranger, a boy who seems to fade like smoke, appears outside her home on the moor at night, she knows that at least one of these sayings is no longer true. The next night, the children of Near start disappearing from their beds, and the mysterious boy falls under suspicion. As the hunt for the children intensifies, so does Lexi’s need to know about the witch that just might be more than a bedtime story, about the wind that seems to speak through the walls at night, and about the history of this nameless boy. A dark and mysterious novel, we follow Lexi, a young girl in a tiny, isolated village on the moors, still mourning the loss of her father. She’s not happy staying at home, she’d rather follow in her father’s footsteps, working and hunting on the moors. When children start disappearing from town à la Pied Piper, Lexi is desperate to find answers to protect her beloved little sister, before she’s next. It doesn’t help that the children start disappearing just when a stranger appears in town, a boy who is more than he looks. I think this is the first V.E. Schwab book where she uses first person narration. The novel follows a somewhat familiar YA fantasy plot, with a dark, mysterious danger, and a heroine who doesn’t conform. I found it a little odd that in such an old fashioned, puritanical town, we’d have a girl with such a modern name like Lexi, but whatever. She’s a bit – I hate to say this – flat, since her character can be recapped by two traits: not fitting in, and fiercely loving her sister. However, we already see traces of Schwab’s signature voice in the way Lexi stands up to the men in her village, and in the incredible atmosphere she creates. When I was reading the book, I couldn’t help but feel cold. It’s a perfect ghost story, in the sense that it really does raise goosebumps on your skin, without resorting to cheap horror tricks. It made me feel like I was watching The Crucible – on the Moors of England. The oppressive fear of the ‘other’ makes the air thick and hard to breathe. So while my first reaction to the book was that I could see the plot coming a mile away, I was still transported by it, and blown away (no pun intended) by the subtle worldbuilding. MOORS! WITCHES! MAGIC! HECK YES! The love story was also a bit flat. Cole is probably my favorite character of the bunch, but it felt super weird to read an instalove here. I was more excited about the actual story of the Near Witch, and wanted to spend more time tracking her down, and learning about her past. I thought there might be an extra twist at the end, but none came. I think it’s why I loved the short story that came after so much – Cole’s point of view, written with the power of Schwab’s writing ten years in the making. This might be a bit blunt, but I think the best part of reading the Near Witch, now, is seeing how far V.E. Schwab has come since. The Near Witch is good, especially for a debut novel. But compare it to Vengeful… it’s like watching a child grow into a queen. Schwab has grown so much as a writer in the past decade, and it shows. It just makes me even more excited to see what she writes next! Massive thank you to Titan Books for sending me the new collector’s edition! A a massive fan of R.R. Virdi’s work, I couldn’t pass up a chance to be a part of the blog tour for his new Scifi Epic, Star Shepherd. I am so, so thrilled to be able to share this new adventure with you, I can’t even put it into words! Star Shepherd just came out on Tuesday, and while I haven’t had a chance to read it yet, you know it’s going to be amazing since it’s R.R. Virdi. And now, onto the official blog hop tour info. Please get yourself comfortable as we take a daily tour through these fabulous blogs. Each blog you visit will entertain you with exclusive articles and excerpts from this fantastic new book. Get an insight into the character’s head with interviews and profile images. Then hunt down the hidden word that will get you one step closer to the $10 Amazon Gift Card. Star Shepard is the first book of new the space western series, Shepherd of Light. Biggest fear’s likely having my wings clipped, stuck somewhere locked on land–worse, prison. No way to fly, no space to sail through. All that openness just gone. Never had much time for laughter of late, but seeing Ahiko (my co-pilot) getting flustered is pretty damn funny. Never really lived my life seeking achievements and the like. Figured it was enough to do what I loved for every moment — flying, shepherding. Do you have a memorable journey? Every one of them where I can fly when and how I want. When I can fly free and open, no passengers and pre-set destinations Liberation. When I can just sail with no compass. Suppose the ability to shut others up would be mighty great. Does that count as a talent, or does it fall somewhere else? Might change my sense of right and wrong. It seems to buy me a lot of trouble I’m not keen on paying for, but I end up doing so anyhow. Never thought much on one, truth be told. That’s a no. Don’t forget to visit all the blogs and collect the 10 hidden words for your chance to win a $10 Amazon Gift Card. Blog Hop Tour organized by Author Assist. I’m not gonna lie, this book was one of my highest anticipated reads of the year, and so it bore the weight of my massive expectations. Even so, it somehow blew them all away, making me already resent the fact that I have to wait another year for the next book! It’s so amazing, I don’t know if I can even put my thoughts into words. Spoilers here on out for the first book, Honor Among Thieves! Zara Cole was a thief back on Earth, but she’s been recently upgraded to intergalactic fugitive. On the run after a bloody battle in a covert war that she never expected to be fighting, Zara, her co-pilot Beatriz, and their Leviathan ship Nadim barely escaped the carnage with their lives. Now Zara and her crew of Honors need a safe haven, far from the creatures who want to annihilate them. But with two wounded Leviathan to treat, plus human and non-human refugees to help, they’ll have to settle for the nearest outpost, called the Sliver: a wild, dangerous warren of alien criminals. Zara’s skills from the Zone may be invaluable. However, Zara discovers that the secrets of the Sliver may have the power to turn the tide of the war they left behind—but in the wrong direction. Soon Zara will have to make a choice: stand against the ultimate evil or run from it. But she’s never walked away from a fight. While the first book took place over a couple of months, this one is more condensed to a few days, I think about a week (ignoring moments of time that are breezed over because people are either healing or traveling). The revelations from the end of book one have shaken the characters, and Zara is faced with whole new responsibilities – and aliens. I love the growth of Zadim, the Nadim and Zara relationship. They are just so fantastic together! The authors explore so many different kinds of bonds and love, and it’s amazing how they’re creating something beyond romantic. It’s also refreshing to read a YA that doesn’t focus on physical attraction and our human understanding of love. The authors really push the SF envelope by exploring what we can only imagine. The bond matures as Zara begins to explore beyond our human understanding and senses, how they are better together, and how this bond can still continue to grow. On that same note, it was entertaining watching Zara grapple with the spectrum of alien genders. What pronouns are we meant to be using? How do we relate to something that earth has no equivalent of? It was done in such a natural way that it didn’t feel contrived at all. A handbook for astronauts on first contact missions! Zara herself has grown so much since she left earth. She might not want to admit it, but she’s really grown into her space legs. Her rough upbringing in the Zone back on earth means she’s able to handle any tough situation that space can throw at her, but we see in the way she approaches problems that this instinct has grown into something stronger and new. I loved the new characters this book introduces, especially Starcurrent. Zis race of singers are so fascinating. Not only that, but ze is an amazing character, introducing Zara to the dangerous world out here. The focus on signing and music adds another dimension to the worldbuilding. I could keep going on and on and on about how much I love this book, but I’m going to wrap up. Honor Bound is brilliant. It’s fast passed and exciting, full of action and a whole new kind of romance. Exciting from the first page to the last, with a sense of exploration and wonder, along with universe-shattering dread. Gosh, I cannot wait for the third book! Today’s post won’t be a review – not of books, anyway. Maybe it’s a review of myself. And the headline is – this girl buys too many books. I’ve realized that my current book buying habits aren’t healthy. Every time I’m stressed, I react by buying something on my wishlist (“I deserve this!” I cry as I sob into my laptop, spoonful of Nutella in hand) and thanks to Prime it’s in my hand not two days later. A miracle. And then I see the state of my TBR cart and realize that I’m more stressed than I give myself credit for. So. Starting today, March 1st, I will not buy a single new book, and focus on reading books that I’ve been meaning to read the longest. Nevernight, Crooked Kingdom, The Miseducation of Cameron Post… books that have been staring at me from their perch on my TBR shelf, begging “read me, read me!” as I crush them under unread brothers and sisters. Yeah. I might also have trouble with anthropomorphizing my books, but that’s a struggle for another day. Then, in April, my goal will be to focus ONLY on Indie reads. My Indie TBR is its own shelf and it’s as intimidating as my traditional pubs! I want to finally finish reading the Color of Water and Sky series, and devour the Billie Dixon books, and enjoy a Goode Grace Myster (or two!). So that will be my month of April. And finally, in May, my birthday month, I will be focusing on treating myself to re-reads of old favorites. I want to enjoy A Darker Shade of Magic sequentially, instead of my year-long wait between books. Binge read, baby! I want to reread the Lord of the Rings since it’s been a decade since I last enjoyed them. Maybe even Illuminae, to prepare myself for the massive pile of Jay Kristoff books that he’s publishing this year. The only exceptions to these reading lists will be books sent by publishers, or preordered books that I’m excited for. Such as for example Priory of the Orange Tree, which may take over my life for a little while. I will also continue to read and review ARCs at the same time, as these are on my ebook and allow me to read two books at once without feeling the guilt. If anyone wants to join me for this endeavor – indie author month will be so fun! – just let me know either in the comments below or on Instagram @readcommendations. I’m excited for this adventure! I’m a massive fan of Mary Fan, who wrote one of my favorite YA SF books of all time, Starswept (see my review!). So when I saw the announcement for this book, I knew I just had to read it. A hero’s journey through a fantastical Qing dynasty China, where we have steampunk technology mixed with magic, a lady warrior who wields a dangerous blade… this is the exact book I needed in my life, and it was perfect in every way. Anlei is one of those fierce Warioress characters who jump out of the page. A village girl, trained as an acrobat and struggling with dyslexia, trying to find her place in a village where a woman’s place is in the home. It is a vocation she respects, but knows deep down is not for her. Being able to fight for her village takes courage, but not so much courage as when asked to marry a complete stranger in order to solidify the promise of protection for her people. Tai, a thief with many mysteries up his sleeves, is the perfect foil to her character. He always seems to have the perfect joke or quip to catch her off guard. They make a perfect fighting pair, a team built on respect and trust. I loved seeing the two of them fight together both with a sword or with their words. And the magic, the technology – the concept itself is so cool. I love the idea of giant bronze dragons soaring through the air, ships propelled along the breeze, swords harnessing ancient magic. All this to fight an enemy straight out of a nightmare. Once again, Mary Fan proves she is the master of twists. She manages to take a story that seems to be going one direction, then swing it around until it is going another – while making me wonder how I couldn’t have seen it before. This book constantly keeps you on your toes! While I haven’t read many Chinese tales, I feel like Stronger Than a Bronze Dragon reads like a cross between YA fantasy and a Chinese hero’s ballad, almost poetic in a sense, a journey to save one’s people, an ode to family, culture, and tradition, in the face of massive danger. The author’s writing is somehow even more lyrical than in her Starswept books, which I assumed we musical simply from the fact they were about music – turns out Mary Fan can bring this same music to Steampunk China. If you’re looking for a story you will never have seen anywhere else, with characters you can fall in love with while simultaneously want to fight alongside with, then you are going to love Stronger Than a Bronze Dragon. Thank you Mary Fan for sending me a copy to review! I didn’t know where this book would go when I started reading it: at first glance, it seemed like a traditional dystopia, with the world post-apocalypse, and the surviving humans split between the outsiders (who live in the forest) and those inside the Lifedome, a massive structure housing what is left of civilization. We follow Talia, an outsider, hunting and gathering for her family until the day her brother and grandfather are taken in a raid by those mysterious people inside the dome. And that’s when every expectation I had got thrown out of the window, and my mind was blown. Mild spoilers from here on out: if you don’t want to know what society is like under the dome, and would rather find out for yourself, head on over and start reading the book now. If you don’t mind having that spoiled for you, it’s what I found the most compelling with the book, and I’m going to rave about how awesome it is. The dome was built before the downfall of humanity in order to house massive strides in bioengineering. It’s only logical that when the apocalypse came and mankind needed a place to ride it out, the elite got the better end of the deal, and the lower classes – let in by sheer pity and necessity for a labor force, à la Snowpiercer – got the sharp end of the stick. The new society is entirely ruled by the fundamentals of bioengineering, artificial selection, and genetic experimentation. And the Roman empire. Because what cooler combination than modern day Romans trying to bring their myths back to life? If you enjoy Greek/Roman mythology, then you’re going to see it come alive in marvelous, terrible ways. The author’s abundant knowledge of Roman life and culture infuse the novel with a degree of realness that you can’t help but be drawn in. On top of the cool premise, we have Talia, a headstrong main character with a massive love for her family (she reminds me a little of Katniss in the way she deals with disaster) and a secret that could end mankind if it ends up in the wrong hands. With the help of a mysterious knight named August, and her lifelong friend Max, Talia battles the cruel realities of the dome and its vicious despot, Octavia as she tries to rescue her brother and grandfather. While the love triangle felt a little forced, I’m 100% team Taugust (is that a thing? it should be a thing) though someone should really tell August calling a girl ‘Feral Cat’ all the time isn’t as sweet as he thinks it is. Oh well. This book is if The Isle of Doctor Moraux was crossed with Hunger Games but written by a Roman. It’s exciting, fun, and brilliantly clever. I cannot wait to read the sequel! I want to thank author Michelle Kenny and Harper Collins for providing me with a wonderful review copy. Readers of this blog know how much of a massive fan I am of M.C. Frank, author of the ‘No Ordinary Star’ trilogy and the beautiful ‘Salt for Air’. I’ve been so excited for her Robin Hood retelling, which I’ve seen teased on most of her social media platforms… until today, where my excitement reached new heights, as she revealed the cover! Behold! This Robin Hood book will steal your heart. Robin Hood, hidden deep in the Sherwood Forest, is fighting to restore the land to its rightful king, surrounded by his faithful friends, green leaves and clear skies. He is also fighting to keep himself and his company alive, but that comes second. Burdened with secrets, betrayal and an incredible responsibility, this is what keeps him awake at nights: Survivor’s guilt. The girl he was in love with as a lad died saving his life five years ago. Robin has exhausted himself looking for her with no hope of finding her alive, when he meets a slender youth who surprises him with his courage and skill with the bow and arrow. Little knowing that both their lives will be irrevocably changed. In the grand castle in Nottinghamshire lives an unhappy and tortured lady, forced to obey the wishes of a tyrannical Sheriff and his ruthless assassin, Guy of Gisborne. They have trained her for years, with one purpose in mind only: she is to be disguised as a boy, and sent to the forest to assassinate Robin Hood. On their orders, she pretends to sneak out to the forest in danger of her life, to come to the aid of the outlaws. When, in reality, it is she who will destroy them. Then, Robin and the “boy” meet. Two worlds collide, resulting in unimaginable danger and intense romance. Maybe, just maybe, they can be each other’s salvation. But will they survive the unimaginable truth when the past comes back to haunt them both? In honor of the girl who saved his life, Robin has vowed never to hurt a woman. So it’s only a woman who can kill him. But what if his assassin falls in love with him? What if she’s never stopped loving him, not for a single moment?